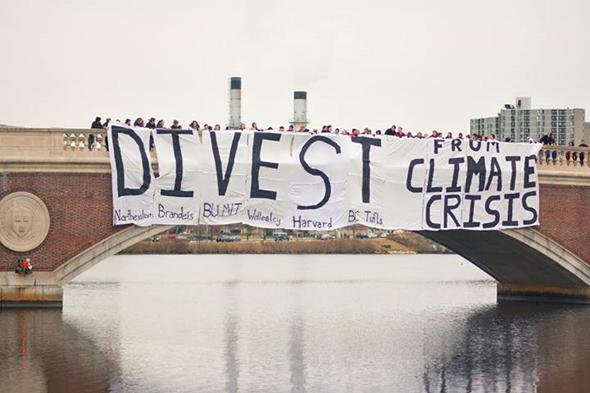 Harvard climate change divestment movement: The economic logic is bad, but it makes sense anyway. Here’s why I signed a petition calling for it anyway. An action on December 8 organized by a group of students from different universities across Boston. Late last week I got an email from one of the organizers of Divest Harvard. It’s a pressure group aiming to persuade America’s richest university not to invest its endowment in fossil fuel extraction companies. This would mean immediately shedding $34.6 million of endowment stock currently invested in such firms, and then, over five years, looking to untangle various indirect investments. Would I write about the campaign? Would I sign a petition? I said I’d think about it. Then I thought about it. I decided fossil fuel divestment doesn’t make much sense as a matter of economics or corporate finance. A nonprofit, a pension fund, or a municipality that decides to join the divestment movement will cost itself some money and hassle and not do much to halt climate change. Then I decided to sign the petition anyway, and you should, too, if there’s a similar movement at an institution you’re affiliated with. But first, the problem with divestment. Just as paying dividends isn’t a way of “returning” money to investors, selling shares in a coal company doesn’t actually deprive the firm of any financial resources. University endowment money isn’t “in” the company, so one institution’s decision to sell shares in the company is irrelevant to financing its activities. Contrast this with something like a campaign to shift deposits out of a given bank. A deposit is a kind of loan to the bank—money that a bank can put to work financing its own lending or asset purchases. If lots of people walk away from a particular bank, then it will need to start offering more generous interest rates to obtain the money its managers want. The bank’s cost of doing business, in other words, will go up and profits will fall commensurately. When it comes to an equity investment, things look different. If a whole bunch of universities dump shares in coal companies, the share price of those companies will go down temporarily, making their CEOs look bad. But this simply creates an opportunity for other value-hunting investors to pick up some shares at a discount. In fact, in the age of algorithmic trading, the entire process will run its course in the blink of an eye. Nobody will even notice it happened. Divestment appeals in part because campus activist groups remember the legacy of the campaign to persuade universities to divest from apartheid South Africa in the 1980s. But the South African divestment campaign was paired with a large-scale boycott of South African goods and sanctions on South African entities. That’s where all the real damage was happening. And clearly, if you could persuade people to refuse to purchase gasoline or coal-fired electricity, that would depress the price of the underlying commodities and slow investment in their extraction. But the nature of the climate change problem is that it can’t really be fixed through individual action. There’s no real way for an individual consumer to know the energy mix that goes into the products she buys. More to the point, complicated systems that govern electricity distribution and transportation can’t be effectively overhauled on a person-by-person basis. Reform needs to be regional—if not national—in scope. Yet for all the problems with divestment, it still seems like an OK concept. There’s plenty of merit in the idea that mission-driven nonprofit organizations that claim to be acting in the public interest should refuse to profit from socially destructive behavior. And while the practical impact of even widespread divestment would be small, it wouldn’t be nothing. Nobody, not even a rich businessman, is motivated exclusively by a concern for money. People crave esteem and recognition. Indeed, one thing that already prosperous people like about money is that extra riches tend to earn you extra esteem. Americans mostly admire successful business executives; they’re given more respect and social deference. Divestment is, in part, a way of clawing back that respect. Divestment says: If you make your fortune digging fossil fuels out of the ground and poisoning the air by burning them, then people are going to shun you and your business. Maybe you’d like to consider a different line of work? Or think about pivoting your firm toward less reliance on dirty stuff? Most of all, maybe you’d be better off if your country adopted proper policies for taxing carbon dioxide emissions? In a world of proper carbon pricing, there would be no net negative impacts and no reason to divest from anything or shun anyone. Making these kinds of campaigns the centerpiece of a movement against climate change would be a mistake. But despite the economic realities, as a complementary effort—and especially as something student activists are well-positioned to do—divestment campaigns make a lot of sense.